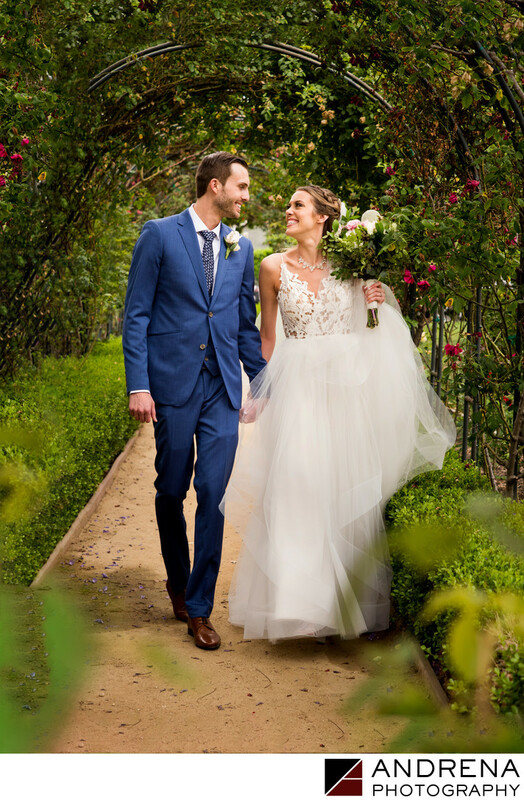 The Westlake Village Inn is known for their beautiful grounds and wedding ceremony locations, as well as for an attentive staff and numerous backdrops for photographers to create magical photos. At certain times of year, the property seems to be in full blown with gorgeous flowers and greenery everywhere. The arbor is a favorite of most wedding photographers, as the beautiful vines and plants curl around arches to create a romantic tunnel that couples just adore. The wedding ceremony area features a grand bronze gazebo that provides a beautiful backdrop for a couple's vows to one another. If you're getting married at the Westlake Village Inn, be sure to ask your photographer about the very best ceremony time to get the best light in their beautiful ceremony area. Different times of year can involve side light or spotty light, when soft, even light is best for photos. Wedding venues like the Westlake Village Inn that feature so many beautiful photography locations help us put together gorgeous albums for our clients. Location: Westlake Village Inn, Westlake Village, California. Keywords: Arbor (3), Wedding Photographer (3), Weddings (6), Westlake Village Inn (3).